The cozy log cabin accommodation at Thousand Hills Golf Resort is a great place to stay after spending a fun-filled adventure in Branson. 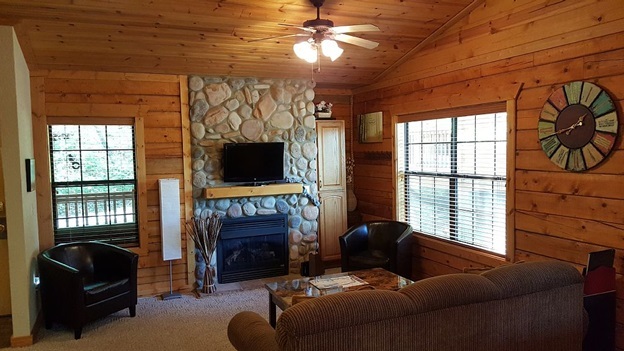 This beautiful log cabin in Branson is the best place to recharge your body’s energy if you plan to enjoy exciting outdoor activity and other outdoor adventures in the area. As each log cabin in Branson is fully furnished with free wireless internet access, cable TV with HBO, DVD player, and a bunch of top quality amenities, this can help every guest to effectively enjoy a wonderful rest in preparation for the next day’s adventure in Branson. The fully equipped kitchen of every log cabin in Branson also help assures guests to enjoy a convenient and comfortable stay as the kitchen is completely furnished with modern appliances such as fridge, microwave oven, dishwasher, washer/dryer, pots and pans, and kitchen wares and utensils. As guest of Thousand Hills Golf Resort, you can also have the opportunity to enjoy the great surroundings as the place is beautifully located in a secluded area that is abundant with beautiful wildlife, unspoiled natural scenery and pristine waters of Table Rock Lake. The good thing about Thousand Hills Golf Resort is that it features things that can surely entertain guests while they are enjoying a relaxing day such as in the activity center that offers arcade games, board games, pool tables, and a bunch of DVDs to borrow. The exotic location of the log cabin in Branson gives you the opportunity to see spectacular fresh blooms of flowers and plants and the lush greenery all over the place. The refreshing and relaxing atmosphere in a calm environment that you can experience in the area will let you forget temporarily crowded and noisy city life. If you stay in a log cabin accommodation at Thousand Hills Golf Resort, you are guaranteed to experience the luxury and comfort which is seldom enjoyed in regular hotel rooms. The cozy log cabin accommodation at Thousand Hills Golf Resort will let you experience a unique and luxurious vacation as each cabin features king size bed, a separate living room, Jacuzzi, and a mini kitchen. A wonderful stay in a log cabin in Branson, will also let you enjoy its whirlpool tub, stone fireplace, and a two-person rain shower. Log cabin accommodation at Thousand Hills is beautifully located near the 18-hole golf course considered to be the most popular golf course in Branson. Guests staying at the lodging properties of Thousand Hills have an advantage to enjoy great amenities such as indoor and outdoor swimming pools and many other special features. If you are an active sports enthusiast, you can easily head on to the resort’s exercise facility or to the 18-hole golf course. So, if you are looking for a place where you can effectively rest in preparation for the next day’s adventure in Branson, stay at a cozy log cabin accommodation at Thousand Hills Golf Resort.